There is nothing that makes us more excited that taking on a total church hall wedding decoration transformation! 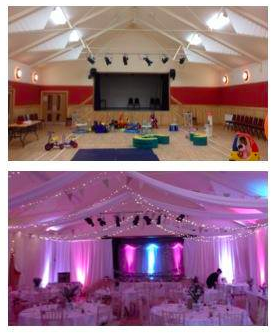 We love taking a venue to the bare minimum – somewhere that hosts toddler groups, brownies, WI meetings and local recitals into…. drum roll please… wedding venues! It isn’t easy. But, boy oh boy, is it rewarding! So, church hall wedding decoration – what do we recommend? The first thing you need to decide on is the quality of the walls and the decor on the walls. It may be that you will need a full wall drape to cover up dated wall decor/pictures/brownie noticeboards. If you do not require full wall drapes we recommend uplighting – it will transform a space and are great for those on a budget. When thinking about furniture for a church hall decor scheme you will probably have an obscure chair that you will want covered – this is where the perfect fit sculptured chair cover will come in to force! It will cover the weirdest and most wonderful of chairs we discover when doing church hall wedding decoration! Available in white, ivory or black they transform spaces with or without sashes! For tables we would always recommend a round table (get in touch for a contact!) as this just screams ‘wedding’ and when you are having the big day in a non traditional wedding function space it is these little things that really make the difference in your church hall wedding decoration! Once you have draping, uplighting and chair cover in place you may want to think about fairylight canopies – this look FAB in church hall wedding decoration set ups. Once these venue standards are achieved then your hall becomes the same as any other venue – time to think about your centrepieces and additional items on the table – all of which we can help you with. If you would like more information on our church hall wedding decoration then please visit our website. If you would like to see some examples of our church hall wedding decoration then visit our Facebook page!